A student of an army-run university was squashed under the wheels of a bus at Nadda in the capital on Tuesday amid the ongoing police traffic week, sparking a massive protest which was backed by the DUCSU vice-president. Sub-Inspector of Gulshan Police Station Sinthia Akter told the daily sun that a bus of Suprovat Paribahan ran over the student around 7:30am on the Pragati Sarani when he was crossing the road through a zebra crossing. The victim was identified as Abrar Ahmed Chowdhury, 20, a student of the IR department at Bangladesh University of Professionals (BUP). road to get into his university bus to go to the university in Mirpur-12. He died on the spot in the road accident, the police officer said, adding that police seized the bus and arrested its driver, Sirajul Islam. Abrar took part in the ‘safe road movement’ protesting the death of two students in a road accident at Kurmitola in the city. 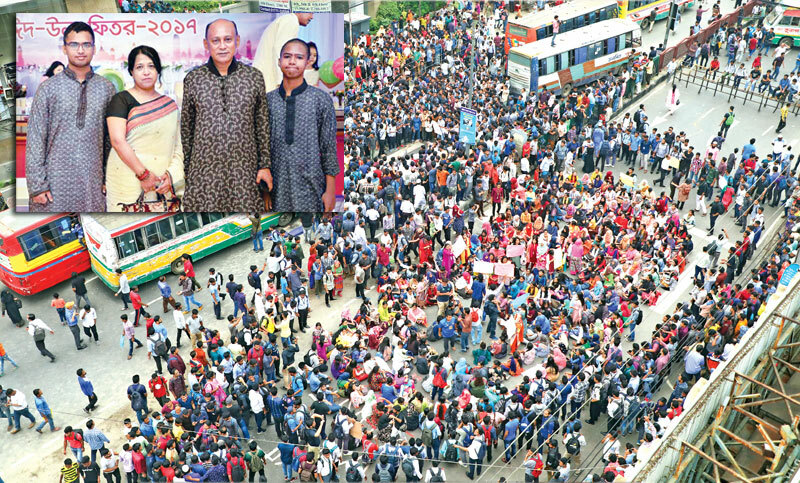 As the news of Abrar’s death spread, hundreds of students from different universities — including BUP, North South and Independent — rushed to the spot and blocked the Progati Sarani that halted traffic on the road from Natun Bazar to Kuril Biswa Road, besides roads and lanes around the areas. At least 20 buses, mostly of Shuprovat Paribahan, which remained parked on the road, were vandalised. One of the buses was torched by a passersby, who was arrested, and the fire was promptly doused by the protesters. The young protestors have place some demands to the authorities and includes: Free the transport sector of political influence and check necessary papers of all buses at regular intervals, punish the perpetrators and all vehicles without fitness certificates and drivers without valid licences should be banned from the streets. Later on the day, DUCSU Vice-President-elect Nurul Huq Nur joined the protests, expressing solidarity with the agitating students. “We will respond properly if you are forced to stop the demonstration,” he told the protesters. Dhaka North City Corporation (DNCC) mayor Atiqul Islam visited the scene and assured the protesters of proper justice. He also pledged to build a footbridge on the spot to be named after Abrar within two months. Registrar of BUP Brig Gen Md Mahboob Sarwar urged the agitating students to go back to classes. Hundreds of commuters were seen walking on the Pragati Sarani as there was no transports on the road. Many of them were carrying their belongings on their heads. The elderly people suffered the most. One Abaidur Rahman,70, told the daily sun that the government should take steps to stop rash driving. Abrar, son of retired Brig Gen Arif Ahmed Chowdhury, was buried in Banani’s Army Graveyard after his namaz-e-janaza on his university campus. DNCC Mayor Atiqul Islam, BUP Vice Chancellor Maj Gen Mohammad Emdadul Bari attended his janaza. On July 29, competition of two buses of Jabael-e-Noor killed two students — Abdul Karim Rajib and Dia Khanam Meem of Shaheed Ramiz Uddin Cantonment School and College — on Dhaka’s busy Airport Road.